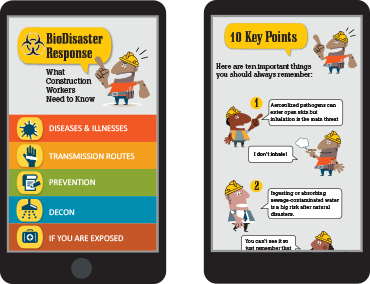 Do your workers know how to protect themselves from exposure to infectious disease or biohazards when they respond to a natural disaster, a major accident, an infectious disease outbreak, or a bioterror event? Gryphon Scientific has prepared a package of two products, backed up by scientists and disaster response experts, that will teach your team how to operate safely in work sites contaminated with biological agents. An online course (that can also be instructor led) contains 100+ slides with full audio, video, photos, and quizzes. Virtual construction worker characters reinforce key points by making wisecracks at the foot of each slide. 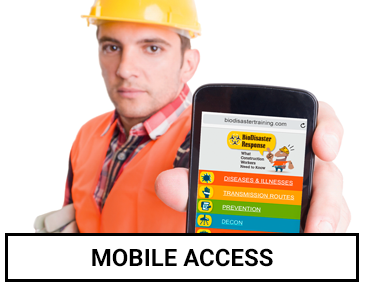 A just-in-time refresher training and reference is accessible via mobile devices. 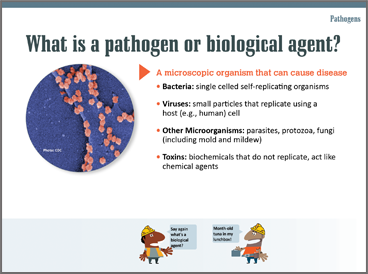 Users can check on the causes and risks of disease, proper use of PPE, and prevention, decontamination, and post-exposure protocols.